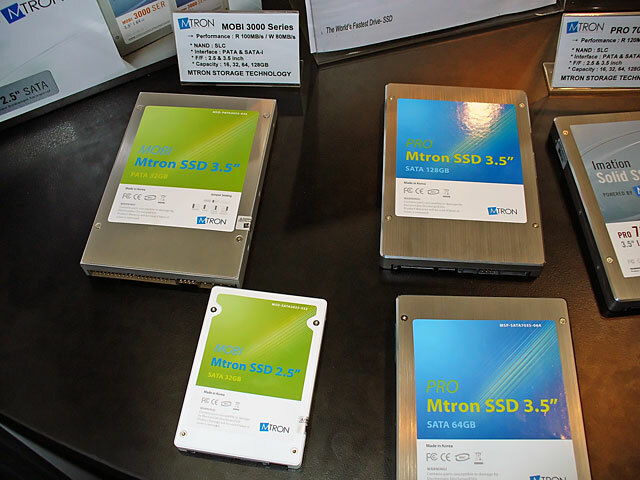 MTron of Korea is one of a number of different vendors who are battling it out to be the best of the best in the solid state drive market.Others include Sandisk/M-Systems, Samsung, Super talent, Patriot, Memoright and many others. The large number of vendors is possible as unlike building a traditional hard disk, building a solid state disk is a more straightforward components with practically no micro-precision engineering required in the overall design and assembly of the device, therefore vendors can concentrate on improving the efficiency and performance of the logic that they use which operates and controls the functionality of the drive. There are only a handful of reputable large scale vendors of the actual memory used in the drives and since the drives are meant for the upper echelon of storage, only the best memory chips are selected and used in these expensive storage solutions. As of May 2008, MTron Storage claim the ‘worlds fastest drive’ for their Mtron SSD PRO 7500 product which features 130MB/s sustained reading and 120MB/s sustained writing performance over the SATA-II interface. Performance testing for solid state storage, wether its Consumer Digital Flash media such as USB, Compact Flash or Secure Digital, or professional SSD are more replicable than those of traditional drives. Independent reviews such as TweakTown’s recent review of a MTron SSD PRO 7000 series drive with 32GB capacity are able to prove any performance claims made by the manufacturer. 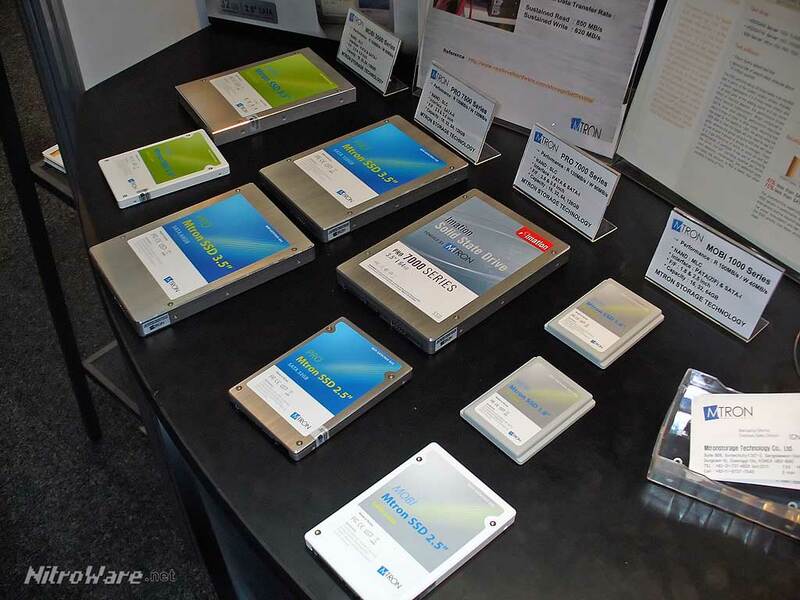 There is a storage war on, The solid state storage war of the 21st century, and quarterly if not monthly a player in the solid state drive industry is introducing a ‘bigger, better, best’ offering. In April, Super talent announced the ‘worlds thinnest 256GB SSD in 2.5” form factor’, and we reported on this drive here. In May, MTron promoted the fact they have the ‘worlds fastest’ single drive (SSD) with 130MB read, 120MB/s write. In June, Samsung announced they will enter the SSD market directly especially with a 256GB SSD offering with a whopping 200MB/s read and 160MB/s write speed specification, taking the ‘worlds fastest’ title on paper at least. There is little known about this product at time of going to press. There is a problem with such independent evaluations though, especially if certain claims need to be tested and verified, and even ourselves as an independent online media outlet we are liable of this. The constant rapid-fire releases by vendors ensure by the time the IT press is able to evaluate such units and their claims in a thorough and detailed fashion; there is already industry news of a successor product from a competitor, that is how fierce the fight is for the small, but expanding piece of pie that is demand for solid state drives that can quickly and simply fit into an existing computer. Some of our readers who keep up with technology topics these events may give you a sense of déjà vu - yes the same thing is happening in the flat plane display industry, where constant evolution and development by panel vendors is enabling Consumer Electronics companies to lead and innovate. Taking all this on board and keen on providing our readers and the community with the facts, we visited Mtron’s stand at CeBIT Australia determined to witness with our own eyes and notepads performance claims made by MTron and to learn how MTron and SSD vendors in general are going to expand their reach and presence of SSD products in the computing industry. 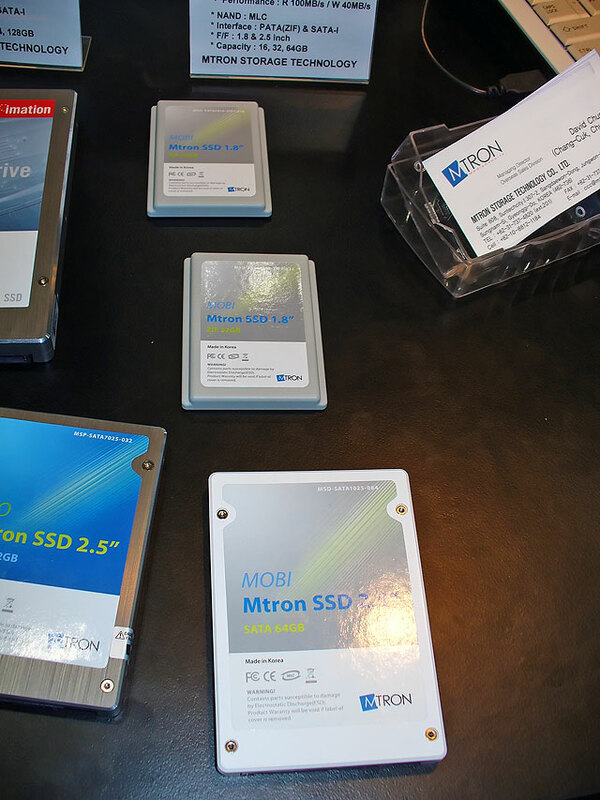 Mtron specifically has three product lines of SSD each aimed at different markets: enterprise, professional, industrial; general purpose – high performance; general –purpose –low weight/power for mobile form factor only. Throughput, Performance, reliability, power consumption and warranty vary between these product lines and obviously so does the price. The firm has colour coded these product lines for ease of identification. ED:At time of going to press Western Digital has implemented a similar planwith announcement that it is now colour coding its traditional hard disk drives black blue and green for ease of identification and comparison as the brand had a somewhat cryptic model numbering scheme in the past. We note some of the drives feature a brushed aluminium case lid which might seem aesthetic at first actually is an indication of the drives sturdy casing. Mtron have gone for a minimalist approach where other vendors such as super talent and Samsung adorn their product with unnecessary decoration, and in case of the Samsung 256GB product, the branding is actually raised which will cause problems in some installations. The smaller and cheaper offerings are in plastic but this is fine given their target market. We note that the firm offers product in both 3.5” and 2.5” form factor with the PATA and SATA interface as well as the 1.8” form factor for thin and light laptops or specialised equipment which uses a Zero Insertion Force (ZIF) connection, offerings for all computing segment. Of note is the Imation branded drive in shot. The significance of this drive is Imation picking up Mtron PRO 7000 series drives as a retail product, distributed and supported by Imation which should be available through a wider variety of distribution channels, e-tailers and bricks and mortar IT specialists than the Mtron bulk or OEM branded product. Imation have dabbled in a number of storage applications for a number of years now and their choice of offering Mtron SSD as a retail product under the Imation brand signifies that they feel SSD is ready for the mass market and that it is a worthwhile product for the technology consumer. IT is also one of the first modern SSD products available through retail channels. We were not able to obtain any pricing or availability information for the Imation branded products but for the time being we do not see prices dropping due to a ‘trusted name brand’ now offering these products.